sheep, and resulting from this the Destrel business is flourishing. Managed by Philippe and Hervé Destrel, this family firm, founded in 1907, has for four generations perpetuated the knowledge and recognition of this product. The animals benefit from optimal conditions of hygiene and comfort due to the feeding and selection centre agreed for Export. purchasing groups of producers, local and regional markets. 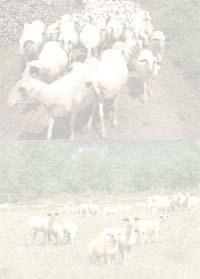 The Destrel Company benefits from a specialized sheep slaughterhouse which is CEE 46 128 01 agreed, according to ISO 9002 standards. Thanks to a superior computer système, the Destrel Company can assure its customers of the identification and pedigree of the animals from the producer right through to the consumer. The Company's refrigerated logistic guarantees the continuity of the cold chain. Thus, the diligence of Destrel Company has brought to a successful conclusion a policy of certified and controlled quality.